After their brand new construction was completed, this family had a beautiful and comfortable home that truly fit their needs. However, this new construction lacked an outdoor living space, which left the backyard feeling stark and bare. With this blank slate, we were able to create a relaxing environment for this family to enjoy. Faced with the challenge of using every square-inch of this small space, Native Edge was able to design a landscape that left this family worry-free. We incorporated a low maintenance composite decking system, modern raised metal planters, and a bubbling urn water feature to tie this peaceful landscape together. The poor drainage of the lot gave us the opportunity to create a striking cat walk and drainage feature, which left ample room for their vegetable and herb garden hobby. There is even a nook for the family dog to enjoy! With coloring completed its time to get this bad boy scanned! This fun and young family moved to this South Austin neighborhood to be closer to friends and family. However, their new home’s outdoor entertaining space and lack of landscape felt underwhelming and unwelcoming. The only redeeming feature was their yard backing up to the greenbelt. Our mission was to design a landscape that was not only perfect for their area, but fit their young, fun and busy professional lifestyle. For the front yard, we complimented the entryway with a mix of modern cut natural stone complemented with water wise plantings. 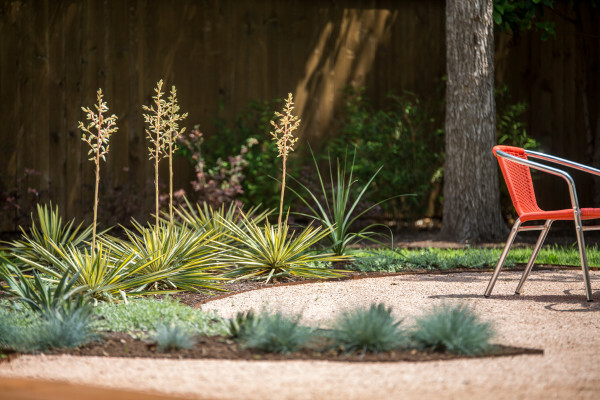 Metal planters, beds of succulents and decomposed granite, as well as other xeriscape features reduced the amount of turf, leaving just enough for their neighborhood movie nights! 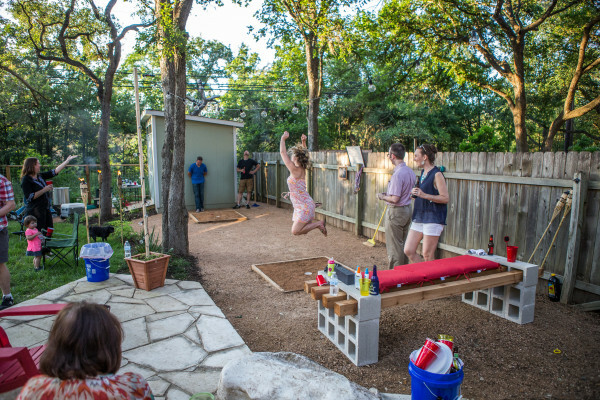 In the backyard, we expanded their entertaining space by defining several new spaces; a stone patio for cooking and lounging, a children’s play area with climbing wall and custom dragon made out of recycled tires, and a washer pit where they can host local tournaments. As custom gas fire pit act as a focal point for the various areas, and provides light and heat as the days get shorter. All of this transitions smoothly into the greenbelt. Giving their yard an endless feel. We’ve been sitting on this news for a year now, and are so excited to get to share with you! In two weeks, watch us transform this property in two days on the first ever Austin Episode of Yard Crashers. Monday, June 8th 9pm CST on the DIY Network!